The Utuana Reserve was created in memory of Hanne Bloch, who worked in the protection of remnant western montane wet forest in southwestern Ecuador. It was initially acquired with funds from the Bloch family. Currently, the reserve is managed by Jocotoco in cooperation with the Arcoiris Foundation. 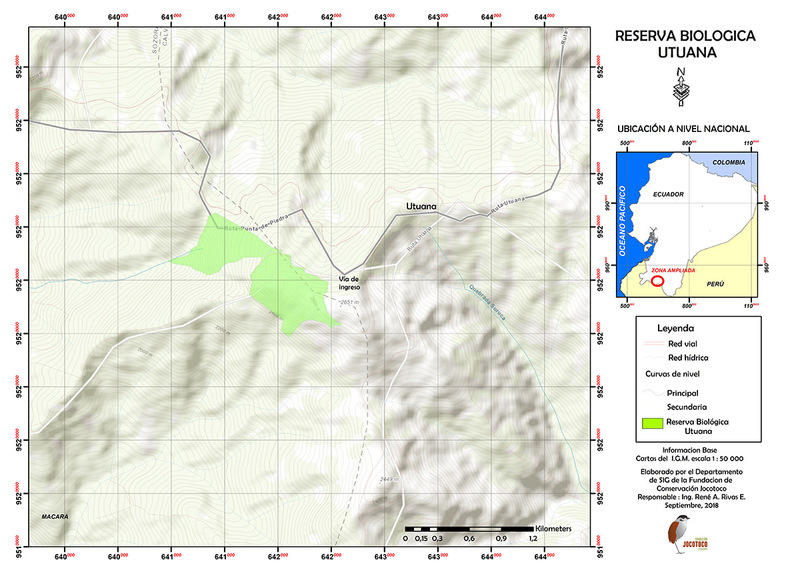 Utuana, is a small reserve, but important for the protection of biodiversity. Formerly it was being destroyed because the local population had little knowledge about its endemic flora and fauna. From the city of Macará: Take the Macará - Sozoranga - Utuana route. After approximately 50 minutes, you will arrive to the city of Utuana, take a road to the right, after 300 meters you will find the entrance to the reserve. From the city of Loja: Go to the town of Catamayo and continue to the city of Cariamanga, 103 kilometers away. Go west to the city of Utuana, take a detour, and after 300 meters you will find the entrance to the reserve. The montane forests protected by the Utuana Reserve, houses several species with very restricted distribution ranges reported in few other locations of the country. This forest is tall, humid and has patches of bamboo throughout. At lower altitudes the forest is replaced by bushes and cultivated areas. The list of birds of Utuana comprises around 110 species. This reserve is important for the conservation of mountain species that are endemic to the Tumbesian region. In the dry season it serves as a refuge for birds from lower areas. You want to visit the reserve Utuana?